Box Dimensions (LxWxH) 4.05 x 1.4 x 1.35"
Eclipse Optic Cleaning Solution (2 oz) is rated 4.7 out of 5 by 15. Rated 4 out of 5 by Anonymous from The Best Way to Clean a Sensor I've tried lots of dry solutions (blowers, brushes, etc.) and they all led to endless cleaning cycles, each one introducing new dirt/dust. The Eclipse solution, along with Photographic Solution's Sensor Swabs got my sensor completely clean after two attempts. Dragging a wet cloth across my camera's sensor will never be a comfortable thing to do (I sweat just thinking about it), but ultimately it's the technique that gets the job done with the least amount of hassle. NOTE: Check out the Photographic Solution's website for video tutorials. It's a simple procedure, but helps to see it done. My results were more effective after following their instructions exactly. Rated 5 out of 5 by S. G. from Gold-standard cleaning solution I use this with Pec-Pad wipes to clean filters and lenses. Extremely gentle cleaning fluid does not leave residue (unlike some other solutions). Rated 5 out of 5 by Anonymous from Works like expected This chemical works great along with the sensor cleaning swabs, which I would strongly advise using. As always, you should use extreme caution when cleaning a digital camera sensor because the possibility of scratching the sensor is very high. The only thing I don't like about this chemical is that it evaporates sometimes too quickly - but that's what it's supposed to do. It's a shame that this product is only available at the store in New York. The reason being is that it is very flammable and can't be shipped because it's considered HazMat. So when in NY, buy all you can. Rated 5 out of 5 by Mason from Product worked well w/o problems Used in conjunction with swabs to clean my camera's sensor. I managed to get a large piece of something on the sensor. The two products used together resolved the problem. Sensor is in perfect working order since my cleaning. Rated 5 out of 5 by JDA-Wildlife from Best Sensor Cleaning Solution Best used with Photographic Solutions Sensor Swabs. Dries very quickly leaving NO smudges (as other solutions do)and removes all dust etc. from sensor. Rated 4 out of 5 by Plankowner from Excellent Cleaner Have been trying EVERYTHING to clean the sensor on my Nikon D70 and nothing worked. Purchased Eclipse solution and some sensor swabs after much research online. Was able to FINALLY get the junk off my sensor screen. Some of the spots were very stubborn but he moistened swabs made it easy to clean the sensor. I would highly recommend this product combo. Rated 5 out of 5 by C. Pena from Best Sensor Cleaning I used; 1)Visible Dust Blower 2) Visible Dust Arctic Butterfly Brush 3) Cleaned with Eclipse and Sensor Swab. 4) Test and check @100% 5) PERFECT @ 100% with one cleaning. I used the same with the Visible Dust swabs & solutions and always had spots. I am reasonable sure that the Visible dust swabs were leaving deposits from the swabs. 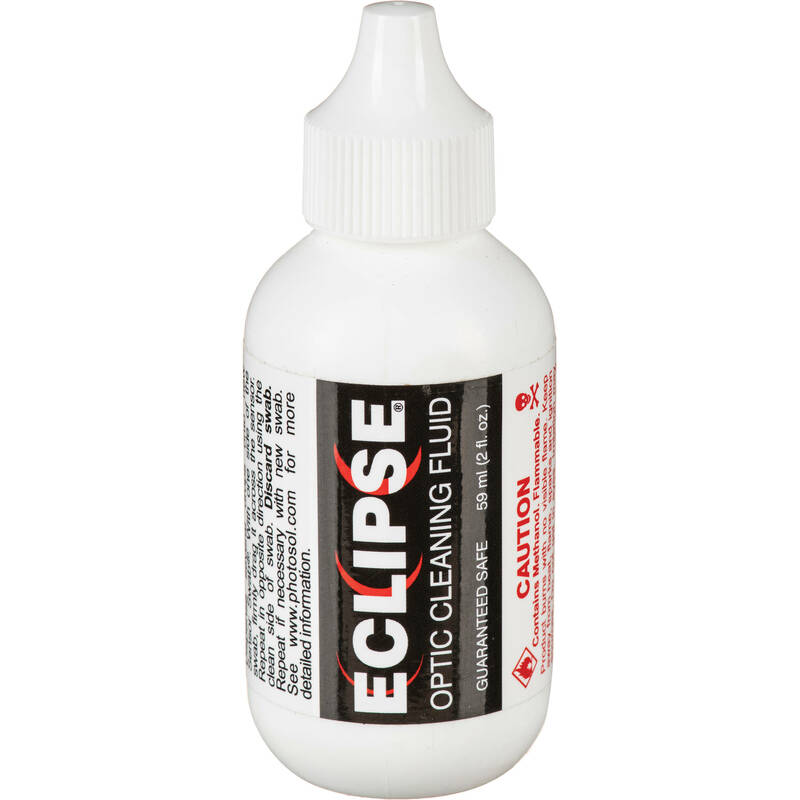 Rated 5 out of 5 by Skyflyer from Best Cleaning agent for Lenses The one and only,Eclipse! Excellent cleaning product, leaves no smudges or marks on the optics and lens glass. Ideal for cleaning sensors, shutter glass, dust covers without any stains. 100% recommended, pro product! why can't this item be ordered online? Due to federal regulations, we are unable to ship this item. What is the expiration date and how many months it can be stored? There is no expiration date as long as it is kept in the original container and capped. I contacted Photographic Solutions regarding this and they stated that the Eclipse Optic cleaning solution is safe to use on the D800s sensor. The Eclipse 2 you mentioned was actually discontinued by them as they were not happy with the manner in which it evaporated which explains why it is not available. Does this leave residue? I have an older bottle of Aero-Eclipse and that one leaves residue.